Irish Christmas ornament is a shamrock wearing a leprechaun's hat that is accented with a buckle along with a shamrock. This Irish Christmas ornament is a green on green design that features a shamrock with a leprechaun's hat on top. The hat is enhanced with an embossed shamrock along with a gold accented buckle. 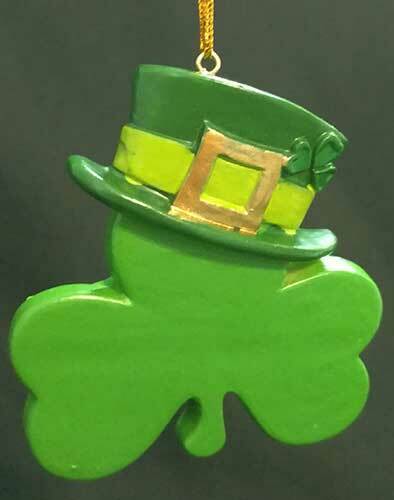 The Irish ornament has a dimensional face and is made of resin; it measures 2 1/2" wide x 2 3/4" tall.